Although the sun was at high noon when it ended, the 2015 Legislative Session won’t be remembered as the Sunshine Session. Cue the theme song from Sergio Leone’s “The Good, the Bad and the Ugly” for a look at the 60 day term in the light of transparency. Proceedings started on a high and good note. House committee hearings began and ended on time. Committees heard and discussed the bills published on the agendas, sometimes with almost a week’s notice. The Senate committee hearings were not as punctual, but even the meetings held early in the session were no more than fashionably late. If bills were pulled from a hearing at the last minute, this was done openly and with explanation. Both chambers allowed the people to be heard. Even contentious bills got a full airing before lawmakers. Committee chair should be congratulated for conducting hearings that maintained order while staying within the parameters of the First Amendment. In some cases, speakers were urged to keep their remarks brief if a number of people showed up to voice support or opposition. One committee chair, knowing an upcoming bill would generate considerable interest, scheduled the hearing for a Saturday in the largest conference room—a practice other chairs might follow. Outside the committee rooms, the halls filled with citizens, journalists, school children, and lobbyists who in keeping with tradition were allowed full access to the Roundhouse and their elected officials. Directing the flow of traffic was administrative staff who, though only 60-day employees, were helpful public servants demonstrating grace under pressure. Though a number of transparency and good government bills were introduced and initially heralded, the final report card was mixed. A strong lobbying bill had a good headstart with an early pre-filing and a low number assignment. However, by the end of session, the bill had been so drastically amended, it limped across the finishing line. (The governor signed the legislation into law). In other good news, the Sunshine Portal was amended to require state contracts to be posted online, while the Health Care Sunshine Portal now will give New Mexicans clear information about the cost and quality of hospitals in the state. Generally, though, bad news dominated transparency headlines. A much needed campaign finance disclosure bill with bipartisan support which had unanimously been approved in previous sessions by the Senate, didn’t even make it to the House floor. Three committee assignments—usually a death knell for bills—assured its demise. This important bill would have shined a light on dark money, disclosing who is paying for campaign ads. Proponents argued that who is speaking is as important as what is being said, but opponents complained, contrary to democratic principals, that requiring disclosure would stifle speech. Other transparency bills fared little better—an ethics commission fell into a committee dark hole, as did bills to archive committee hearings and floor sessions and to require webcasting of interim committees. This is not the first time the archive bill failed to pass, even though the current streaming system is of little use to citizens who spend their days at work. 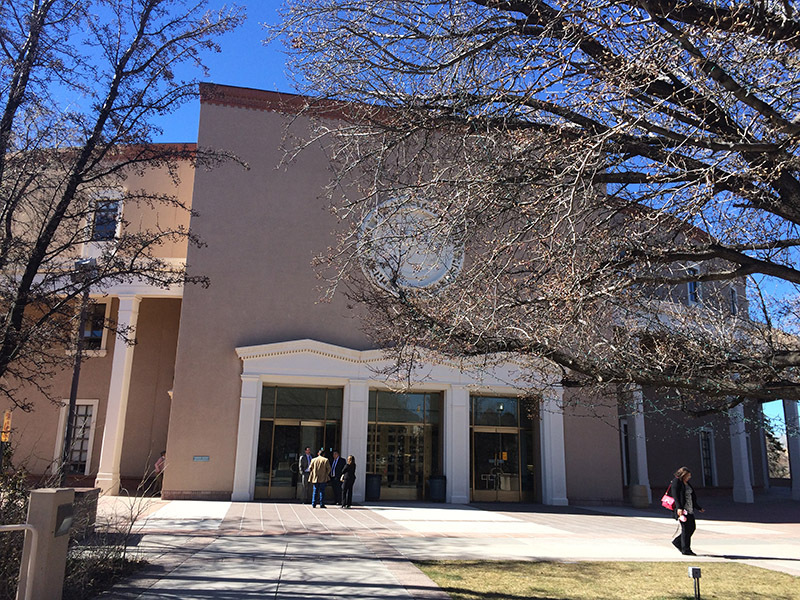 My organization, the New Mexico Foundation for Open Government, urged lawmakers to pass a one-sentence amendment to the Open Meetings Act, which would have required public bodies to allow public comment at public meetings. Currently, the public has the right to attend and listen to public meetings. There is no right to speak though most public bodies provide public comment periods. The bill met opposition from some public bodies and though unanimously passing two committees, sat as number two on the House calendar for four days before final passage. The late date of the House approval meant there was no chance of a hearing in the Senate. About two weeks before the end of session, FOG learned via a lobbyist grapevine, that the bill wasn’t going anywhere. This was the description and fate of a number of bills in the 2015 Legislature. Under the Open Meetings Act, legislators are allowed to meet in secret caucus sessions to plan strategy, but such a process leaves the public in the dark about why a bill fails. Many supporters of unsuccessful bills still don’t know what caused the death of their legislation. As the session neared its close, committee hearings were held late at night, agendas appeared with little notice and rumors were rampant. Deals were struck behind closed doors with minimal discussion on the chamber floors. And speaking of ugly, perhaps the worst example of clandestine deal making showed its face upon the abrupt resignation of Sen. Phil Griego. Several months after a news article disclosed that Sen. Greigo personally benefited from the sale of state-owned real property made possible by Senate action, Sen. Griego resigned with only one week left in the session. Sen. Griego, a committee chair, stepped down after months of whispers and speculation, behavior always fueled by secrecy. The pubic deserved to know the details of the senator’s resignation but members were prohibited from making any public comment. Where were transparency and accountability? FOG’s longtime mantra is that the public has a right to know. Let’s hope the public demands that right during the interim and 2016 sessions. Read the editorial as it appeared online in New Mexico In Depth.